Case in point of how slow the hard drive is can be seen under the titles Project Gotham Racing (PGR) and Dead or Alive 3 (DOA3). In PGR's car select screen and in DOA3's character select screen there is a delay between the time when you select a car/character and when the picture actually appears on the screen. Originally we assumed that this delay was because the system was reading off of the DVD, but upon closer inspection it's clear that the delay was in accessing the hard drive. What's even more interesting is that the delay continues to exist regardless of how many times the car or character is selected in succession, indicating that the data isn't being cached to main memory. With a larger 128MB memory subsystem, it is quite possible that developers would have been able to circumvent this small but noticeable delay by caching the models to memory. 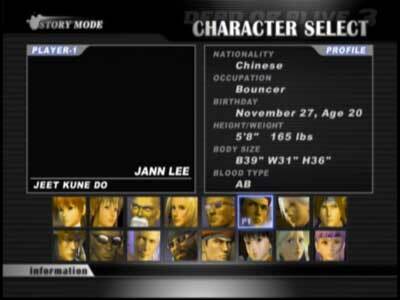 In the DOA3 Character Select screen we've selected the character but his model has yet to appear as it is still searching for it on the hard drive. This delay is usually around 1 - 2 seconds at most. 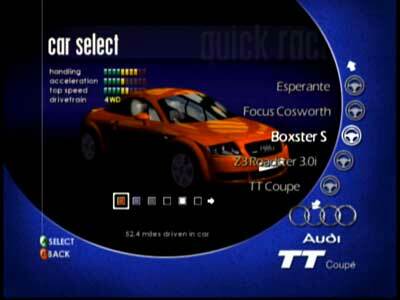 Here in Project Gotham, we've selected the Boxster S but the car on the screen is still the Audi TT coupe. It will be another couple of seconds before the car model switches as the slow hard drive must send data off to memory. With a faster hard drive this process wouldn't take as long, and with more system memory this type of information would be cached in RAM. 1) Getting the Xbox image onto the hard drive. Without modification, no OS will let you access the Xbox hard drive making it very difficult to create a ghosted image of the drive. 2) Getting the Xbox to recognize the hard drive. Currently no hard drive will be recognized by the Xbox. Instead of booting it will spit out a service error. It is still unknown whether or not simply putting the image on the drive would solve this issue. 3) Getting a fast but cool running hard drive. There is no flow of air over the hard drive in the Xbox. In fact, it is mounted on a plastic tray over the CPU and IGP meaning that if anything, it's in the worst possible place from a cooling standpoint. Replacing the drive with a 7200RPM IDE drive would raise many cooling issues which could lead to a reduction in stability or accelerate component failure. 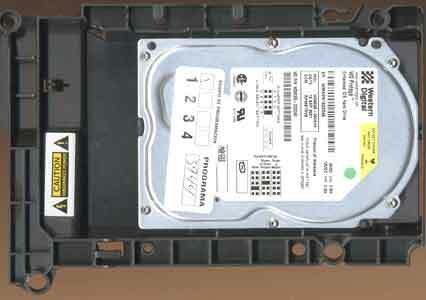 The plastic hard drive tray. Another thing to note is that there is no shock protection on the hard drive itself. Although the use of only a single platter can arguably reduce the damage incurred by dropping the system, the fact remains that the plastic tray that holds the hard drive does not do a very good job of absorbing shocks. In other words don't drop your Xbox.